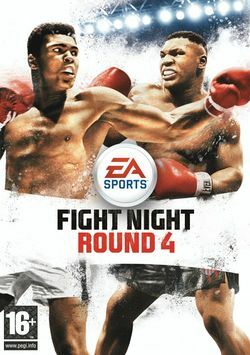 Fight Night Round 4 is a boxing video game published by EA Sports. It is the sequel to Fight Night Round 3, released in 2006. It was released on June 25, 2009 in North America and on June 26, 2009 in Europe, for the PlayStation 3 and Xbox 360. The game's featured boxers are Muhammad Ali and Mike Tyson. It contains 48 licensed boxers as well as several new modes, such as Legacy mode. This page was last edited on 15 May 2015, at 20:59.